Satellite altimetry observes the height of the ocean surface from space. Globally, the observations are used to determine how much the global sea level is rising due to thermal expansion related to warming and adding water from the melting ice sheets. The rate of sea level rise is currently ~3.3 mm/yr starting in the early 1990s (Figure 1). While sea level is rising on long time scales, temporary fluctuations over the course of a few months related to climate variability can occur. In mid 2010 to mid 2011, global mean sea level (GMSL) dropped by ~5 mm (Figure 1). By “weighing“ the ocean using the Gravity Recovery And Climate Experiment (GRACE) satellites, the source of this sudden decrease can be determined. Was there less water in the ocean or was it temporarily cooler than normal? Figure 1: Global mean sea level from altimetry from 1992 to 2012 with annual and semi-annual variations removed and smoothed with a 60-day running mean filter [Nerem et al., 2010]. The slope of the trend (blue line) is 3.2 mm/year after a GIA correction has been applied (0.3 mm/year). The inset maps show sea surface height anomaly relative to the background trend and seasonal climatology, for 10-day averages centered on 3 Jan 3 2010 (near the peak of the El Niño) and 29 Dec 2010 (the peak of La Niña). Image from Boening et al., 2012. The GRACE mission, launched in 2002, measures changes in the Earth’s gravity field. These changes are primarily due to variability in the Earth’s water cycle. Melting ice sheets, changes in groundwater, sea level rise – all these processes involve a local change in the Earth’s mass that can be detected by GRACE. Comparing the 2010-11 drop in GMSL to the change in ocean mass measured by GRACE indicates that the temporary decrease was related to freshwater transport from the ocean to the continents. The GRACE satellites also provide estimates of terrestrial water storage. This information is used to determine to what region of the world the freshwater was transported. The satellite observations show that more water than normal occurred in Australia and northern South America (Figure 2). Figure 2: Change in water mass from the beginning of 2010 (January-February-March average) to mid 2011 (March-April-May average). Blue colors indicate an increase in water mass over the continents. Image from Boening et al., 2012. Heavy rainfall in 2010 led to increased terrestrial water storage in these regions. The El Niño Southern Oscillation (Figure 3) is known to affect precipitation and evaporation over Australia and northern South America. 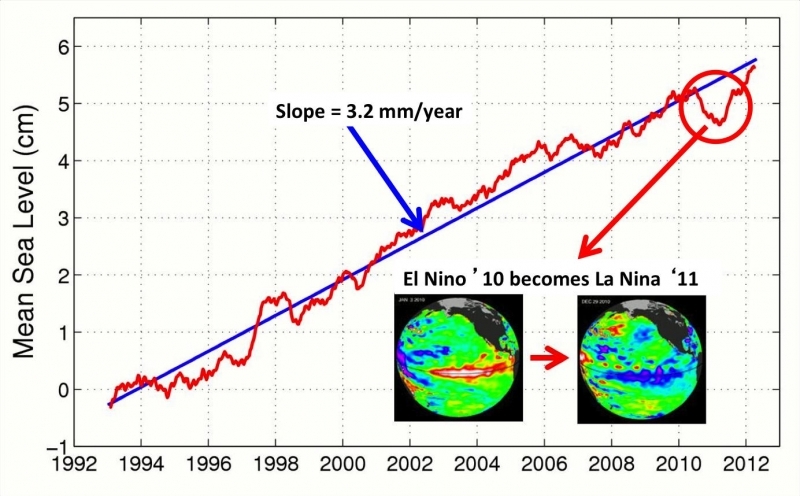 In the El Niño phase it rains less, and in the La Niña phase it rains more. With the 2010-11 La Niña being one of the strongest over the past 60+ years, a large amount of water was transported from the ocean to the continents and led to the temporary drop in GMSL. Figure 3: Blended AMSR-E and MODIS Sea Surface Temperature Anomaly (SSTA) for December 2009 (peak of El Niño) and December 2010 (peak of La Niña). Boening, C., J. K. Willis, F. W. Landerer, R. S. Nerem, and J. Fasullo (2012), The 2011 La Niña: So strong, the oceans fell, Geophys. Res. Lett., 39, L19602, doi:10.1029/2012GL053055. Nerem, R. S., D. P. Chambers, C. Choe, and G. T. Mitchum (2010), Estimating Mean Sea Level Change from the TOPEX and Jason Altimeter Missions, Mar Geod, 33, 435-446.